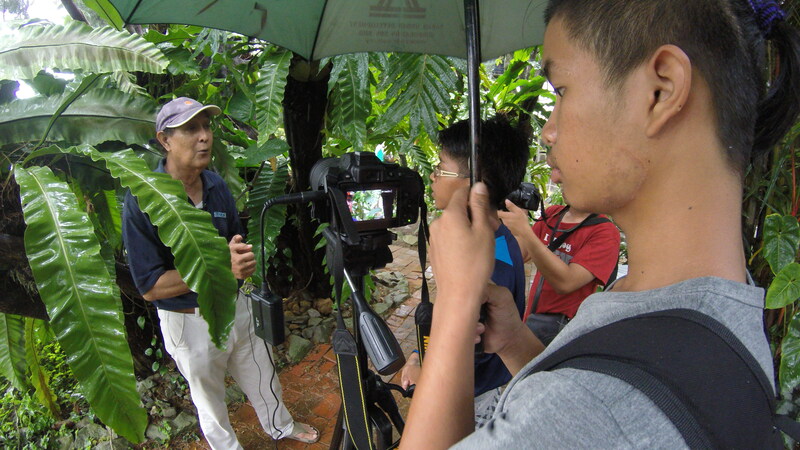 Participants of the 2015 Borneo Eco Film Festival shooting their documentary film. When a journalist who comes from one area of the world flies in to another area and reports on a local issue or incident, then flies back to where he or she comes from, it is known as parachuting. This happens a lot internationally, when foreign journalists fly into a country for a couple of weeks or even days, then flies out again. And it happens locally as well. Tell me how many of you are constantly watching news or documentaries in the media about local communities in rural Sabah told by outsiders? This practice has a big disadvantage because the stories told are usually never from the local perspective, and even worse, sometimes it even disregards local sensitivities. An outsider who comes to a local community also doesn’t understand the local nuances and fully comprehends the context of certain things. I am guilty of this too because I used have reported from many countries over the years. I always make it a point to hire a local fixer to guide me. But it really isn’t enough. And that is why I am a volunteer with the NGO called Suara, are a group that organises the annual Borneo Eco Film Festival in Kota Kinabalu, Sabah. What the group does is, they train local and indigenous communities in Sabah to use video and film to tell their local stories to the world. The festival has been going on for five years now and I am honoured and proud to have been involved with them from the almost the beginning. I just returned from the festival earlier this week and I felt compelled to highlight the work that this year’s participants have done that I think has created justice to the programme. Many of the participants have been following the training for several years and their filmmaking skills have improved tremendously and it shows in the documentaries they produced this year. One group from Kinabatangan made a documentary called ‘Lokos’ (the local dialect for ‘river’) which highlighted the Kinabatangan river pollution due to irresponsible plantation owners. The beautifully shot film tells the story from a local perspective where the village’s fishermen now lost their source of income because of the depleting fish population in the river. Another documentary that needs to be highlighted is ‘Mastal Arikik’ (Small Teacher) about a 14 year-old boy who teaches Bajau Laut children to read. A large number of Bajau Laut children do not go to school due to many issues and this young boy has taken it upon himself to organise an informal school to educate them. There were many more films that tells interesting and amazing stories that outsiders might never have the chance to discover and learn if not for this effort in community filmmaking. Inspiring and amazing is to say the least. In fact, the festival not only attracts audiences from all over Malaysia, but also internationally. This year, the renowned Sundance Institute was represented at the festival by the presence of Bird Runningwater, its Director for Native American and Indigenous Programming. He conducted several talks at the festival sharing his experience and observations in promoting filmmaking in the indigenous communities of North America. Runningwater said that it is important for small, local and indigenous communities to have a presence in mass media because it is the acknowledgment that is significant. Of course, the efforts there are a little bit more established and those who have come out of the Institute’s programme are now full-fledged film professionals. This definitely has opened the eyes to the Sabah indigenous community to the opportunities that lay out in front of them. Like I mentioned earlier – inspiring and amazing. Here’s to a successful 2015 Borneo Eco Film Festival and the hopes that many more years of this noble effort will continue. Watch the video I produced of my experience this year at the 2015 Borneo Eco Film Festival. Listen to The Fat Bidin Film Club podcast where the issue of community filmmaking is discussed.